Before you can run Python scripts on SQL Server, you need to install SQL Server with Machine Learning Services enabled. The process of installing SQL Server with machine learning services has been explained in detail in Configuring R Services in SQL Server. The article also explains how to activate the external scripts and run your first Python program. I would advise you to read that article, set up the environment for running the Python script and then come back and continue this article from here. Following are some of the basic types of operations that you can perform with Python in SQL Server. The if/else statements are used for decision making in Python. Lists, tuples, and dictionaries are the most commonly used Python data structures that store collections of data. In the script above, we create a list “cars”, a tuple “cars2” and a dictionary “cars3”. We then display the second item from the list and the third item from the tuple using their indexes. Finally, we print the dictionary item with the key 3. The loops are used to repeatedly execute a piece of code. They can also be used to iterate through the items of a collection. The while loop in the script above will execute until the value for the “num” becomes greater or equal to 10. SQL Server also supports both built-in and custom Python functions. The following example demonstrates the use of custom Python function in SQL Server. 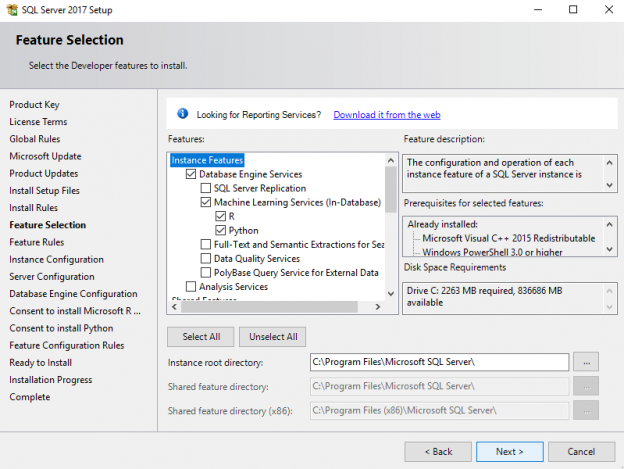 Like any Python editor, you can also import Python libraries in any SQL Server client such as SQL Server Management Studio. In the following script, we will import the Python Numpy library and will use its “power” function to take the power of a number. In the output, you will see the cube of 2 and 5. SQL Server, with the addition of Machine Learning Services is capable of running Python Scripts. In this article, we ran Python scripts for some of the most basic functionalities using SQL Server. We saw how to run a variety of Python operations, decision statements, iteration statements, list, tuples, dictionaries, and functions using SQL Server Management Studio. After reading this article, you should be comfortable with executing basic Python scripts on SSMS.